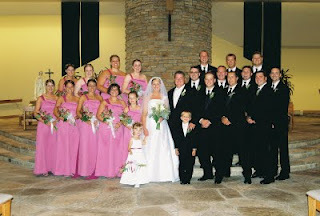 Seven years ago today, surrounded by our family and friends, we said "I do." As I reflect on that day I remember the good things: seeing Collin as I stepped into the church holding my Dad's arm, hearing one of my mom's best friends singing Ava Maria, and being announced as Mr. and Mrs. Collin Konopacki as we walked into dinner. Of course, there were also things that went wrong: the forgotten Subway sandwiches, not getting around to say Hi to all of the tables, and forgetting to cut our cake. Yes! We forgot to cut our cake. We never had a cake cutting!! 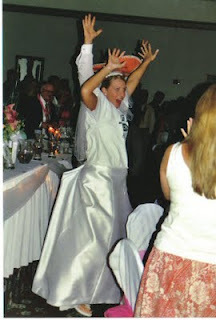 But mostly, I remember the downright crazy fun times: the whole wedding party doing at shot at Hilltop, the limo ride, oh! 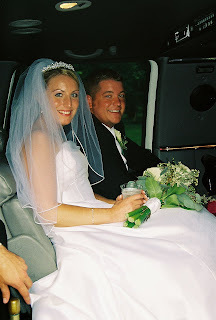 the limo ride, and the grand march and wedding party dance. It's funny how your wedding day can be a little sneak peek into your life together. There will be good times, there will be things that go wrong, and there will be some downright crazy fun. I think, this year more than any, what we've learned is that the key is to find the good and the fun even when things aren't going as planned. There is no one I would have rather navigated through this year with. There is no one I would rather navigate through this life with. Happy Anniversary!!!! Loved your wedding day... my favorites... singing in the Limo and dancing all night long! And that my dad got distracted the day of the wedding and forgot to pack the suitcase that had my cloths in it for the next day... which left me wearing my swim suit the day after... yes- this really happened. Happy Anniversay to you both!! Your wedding was such a blast! My favorites: definitely the limo ride! !, the wedding party coming in to the songs where the DJ didn't play the right parts of the songs :), and coordinating how many? people in a park to get lots and lots of pictures! Oh, and don't forget the chocolate fondue fountain...that was AWESOME! On a serious note, one thing I have always remembered from your wedding day was the song that you chose from your wedding video, "I have been blessed" by Martina McBride. I don't know why I remember that, but somehow, it has a little more meaning as I think about it this year. You guys have had such a challenging year, but through it all you have continued to come back to what's most important...that you have each other and your beautiful children. Everything else works itself out. Congrats on being "blessed" with another year of wedded happiness! I am amazed after visiting your blog!